In June 2016, with the support of UNV and of the United Nations Development Programme (UNDP), the Ivorian government launched the National Volunteer Programme of Côte d'Ivoire (PNV-CI). Its objective was to strengthen the socio-economic impact of voluntary action in the Government’s priority areas for development by improving the socio-professional integration of young men and women in the country. Until today, 471 young Ivorians between 18 and 35 years of age are deployed as PNV national volunteers, and 43 percent of them are women. Volunteering is an essential tool for strengthening national capacities, promoting the implementation of development actions and the social inclusion of youth. In this regard, the United Nations Volunteers (UNV) programme helps Member States to create an enabling environment for the promotion of volunteerism and the development of volunteer infrastructures. “The National Volunteer Programme is an initiative aimed to promote the skills of young people regardless of their social and academic level,” explains Atoum Thomas Tchakpele, Coordinator of the PNV-CI. For him, volunteering is a “privileged form of commitment” to take action for national and community development. The PNV volunteers are serving with more than 60 host entities in both the private and the public sector in line with their capacities. The programme is implemented by a team of five national UN Volunteers and the coordinator of the project who is an international UN Volunteer. UNV's role was to pilot the programme in three regions of the country (Tonkpi, Gbêkê and the district of Abidjan) by developing a mechanism to mobilize volunteers and establish a structure to receive the volunteers through different hosting entities. UNV also developed a monitoring and evaluation system and is responsible for communicating about the PNV-CI programme to strengthen its positioning and visibility. Currently, more than 2,700 volunteer candidates from the three regions are registered with the programme. Danielle Die and Bonniefait Gueu, both aged 24, started working as assistant nurses in June 2017 at the nutritional and medical emergency sections of the Regional Hospital Centre in Mann, west of the country. They both have professional competency certificates in medical care. During the first year, I learned how to take care of new-born babies and to sensitize parents to protect their children from diseases. In the second year, I feel more confident in myself and I am excited for the future,” explains Danielle. She is planning to take a national examination to be a certified nursing assistant in 2019. 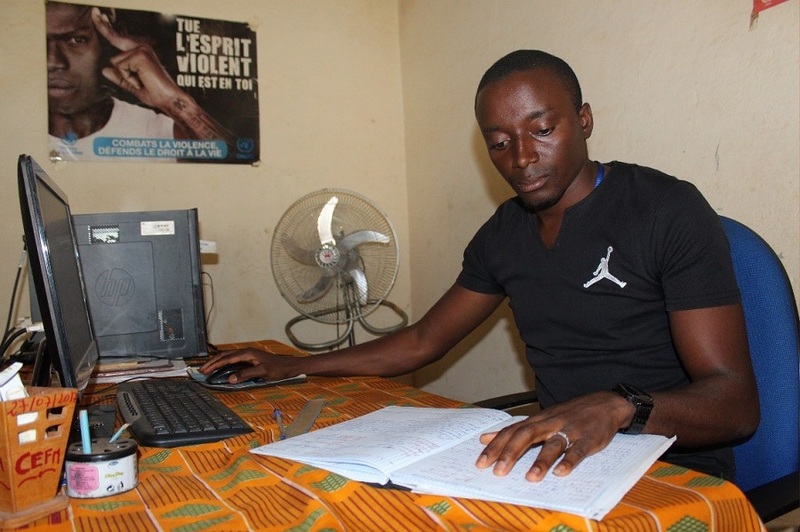 For Dahideu Tiomoko, 32 years old, working as a volunteer is not only about developing his own capacity, but also about contributing to the development of the community. Using his expertise with Excel spreadsheets, he works as an IT Assistant at a local NGO, International Friend Ship (IFS) that supports youth and women in the region of Tonkpi. Dahideu digitalizes and categorizes testimonies about Gender-based violence (GBV) which are collected from the local population. This work used to be done through manual archiving. These new digital data collection enables the organization to better analyse the trends of GBV in the region,” explains Dahideu. According to Mr. Alexi Bi, president of the IFS, these data will be shared with the Ivorian government to develop a national plan against GBV in the country. I feel closer to the population and I feel that I am making a positive contribution to my own community,” says Dahideu. The National Volunteer Programme of Côte d'Ivoire is a successful initiative that strengthens the socio-economic impact of volunteers on national development and the achievement of the Sustainable Development Goals.